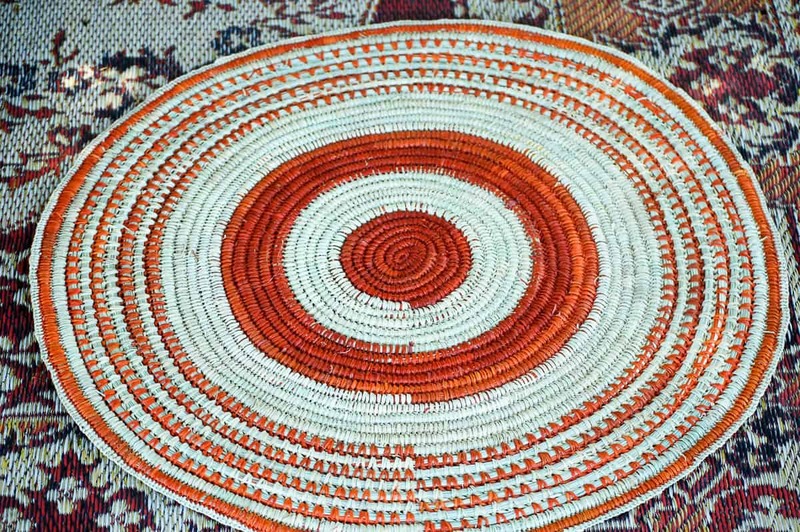 Batumbil Burrarwanga, mat with orange and undyed pandanus fibres. 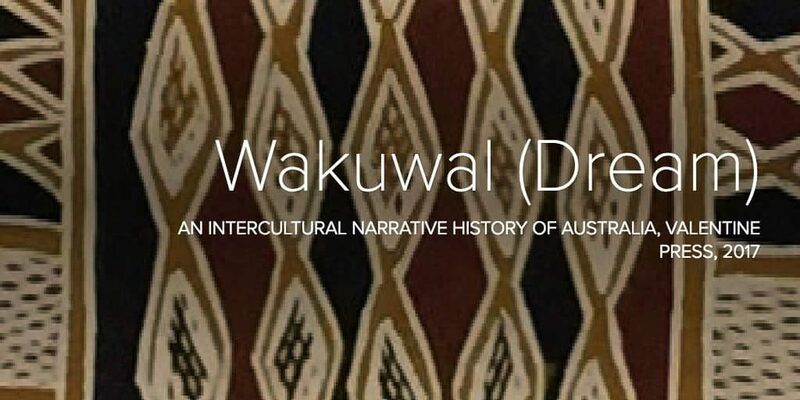 Wakuwal (dream) by Peter Botsman proposes an intercultural history of Australia. On the one hand, it tracks five generations of descendants of an Irish woman sent to Van Diemen’s land for stealing a sheep. On the other, it tells of events that unfolded for Australia’s first peoples and of the interconnections and blockages between new and old Australian cultures. It is a “wild imagining”. The narrator is alternately a spirit being from Éire, an eagle, an octopus, fire, a willy-willy, a sacred dog bounding across the continent, and bäru the crocodile. Yolŋu creation stories of North East Arnhem land embedded in sacred designs as well as Aboriginal stories from the Pilbara, Kimberley and Cape York Peninsula are interspersed with modern narratives of Homer, Christ, Yeats and Joyce. One of the connections between the Irish and Aboriginal stories is the importance of fibre weaving, as revealed in this excerpt that reflects the importance of embroidery in sustaining Irish women convicts on their journey to the penal colony and its resonance with the way the inhabitants of that land create their connection to Country and each other. In Honor’s mind she saw children running across the countryside free. Every child had a faery that would stay with them for the rest of their lives. Even at this worst of times, we put good thoughts into the minds of the children. I began to whisper in Honor’s ear. A better life would, somehow, one day come of the journey to the strange land so far away. She did not want to hear but I would never stop trying and I too hoped that one day we might see the children again. But for Honor and so many others it was the last she would ever see of her homeland and of the children that remained. It was only in death that she would finally re-unite with them. Has this pain of separation ever gone away? Maybe it should never be forgotten. And yet in the years to come so many other children would be taken away from their parents for some reason that no-one could understand. When will people learn? That night I sang a lullaby to Mary as the waves rocked against the bow of the boat. It was a beautiful Irish song – Mist Covered Mountain. I planted the images of Éire into their souls. They would never forget their origins and the fundamental right of a mother trying to look after her children. All pain was catalysing into hate in Honor. She was numb with the loss of her children and dogs. She dreamed of a rising tide, of land by the waterside. Thank god she still had Mary. Other women, who had lost much more, accompanied Honor and Mary on the great voyage, only this recognition and compassion for those even more unfortunate gave Honor some sense of equilibrium in her emotions and feelings. That night we felt new strains and creaks within the internal timbers of Maria. Honor and Mary had only a small cot to themselves but it was enough. They were heading into the open sea and the rolling of the swell now created a steady rock. In a habit that was to last her lifetime, Honor took out the small needles given to her by Cathleen and carefully began to sew. At first it was tentative, but then Honor started to apply her legendary concentration. Each tiny stitch was carefully made. Nothing would compare with the high quality of Honor’s embroidery. There was never a stitch out of place. The little needle kit and pieces of cloth became magic in themselves. It was here that Honor weaved her spirit and hopes. In later times people who saw the quilts the convict women made wondered at the spirit and magic of the courageous women. There were some things that money could not buy and some spirits that could never be broken. 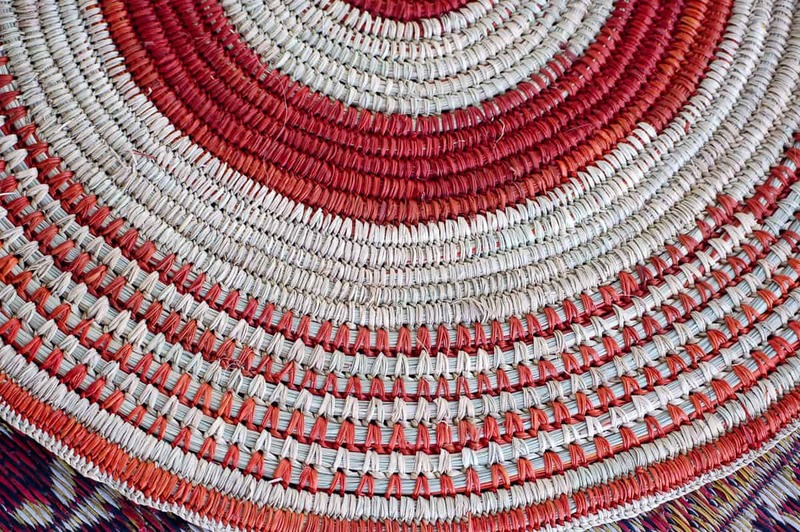 In the future, weaving would be a means of communication between the newcomers and the people of the land. Weaving would join people and land. It would join women across all experience. The sacred djäma of women across the world would come together. 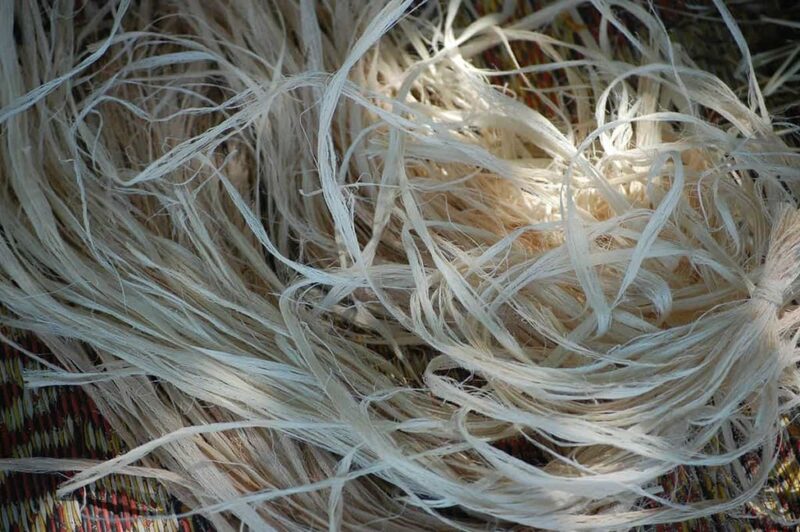 The great weaver of Mata Mata came to me again and again. Knots united peoples. Dyes from the roots of the land. Pandanus harvested and split. So many hours of quiet contemplation and thought. ✿ What did you hope to achieve in writing Wakuwal? I was quite close to Manning Clark and I had several one on one sessions with him at his house at Tasmania Circle in Canberra. His 1976 Boyer Lectures filled me with awe when I came back to Australia from the United States as a young man. I had a very idealised view of what Australia could be. But I struggled to read his five volumes. So from an early time in my life I have wondered how the history of European Australia could be told better and more accessibly. Two Aboriginal women elders Ms S. D. Gurruwiwi and Mrs Butambil Burarrwanga came into my life from the late 1990s and it amazed me that they could recite their family history back five and more generations with ease. They taught me so much about their culture. At a certain point, they asked me where I came from, what was my family and what were my stories? I was ashamed that I could only tell them about my parents and their parents. Batumbil and I met over a memorable stingray meal in the early 2000s. We were discussing the development of the Gi’kal homeland which she and her husband a Galpu elder had initially developed. He had passed away at that stage but his yapa and my yapa Mrs S. D. Gurruwiwi introduced Batumbil to me. It began a lifelong friendship and partnership. I was adopted into the Galpu clan as Djalu’s, the famous elder and Dhuwa custodian of the yidaki, brother and so Ms. S.D. Gurruwiwi became my sister. We have done many projects together. Once you start to work with Yolngu1 people if you are not to be seaweed that comes in and out with the tide you must be brought into the family. Then everyone, all Yolŋu people, can relate to you and know who you are. 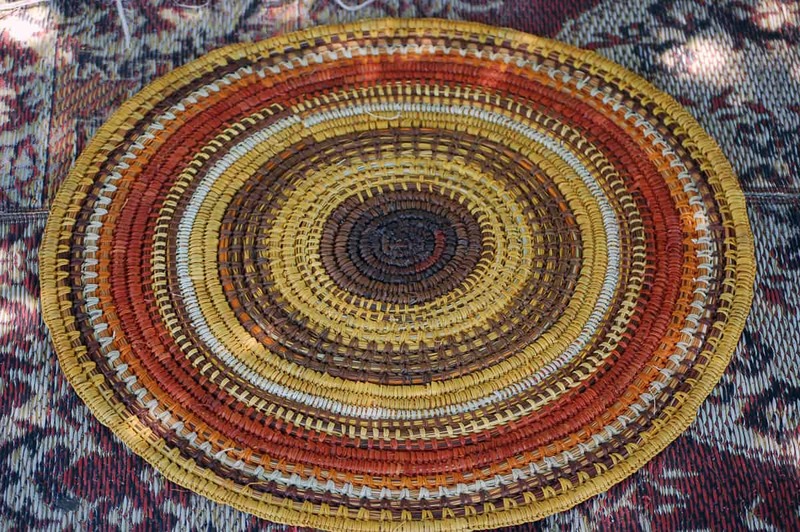 Ms. Gurruwiwi’s brother Djalu played the yidaki into me in the early 1990s and it seemed to unlock something that I had buried in my unconscious. From this point, I had a succession of dreams that framed the writing. I started off writing something for children. I started looking very closely at Yolŋu paintings and reading as much as I could about them, starting with the Yirrkala church panels which really began modern Australian land rights law and have been misunderstood for a long time. Wakuwal is my first fiction book. For me, it has been a wild ride. I still think about new chapters and ideas. I could keep on writing the story forever. My only regret is that I could not include the 20 paintings that motivated many of the chapters and sections within chapters. My feeling was that if they had have been included it would have been too much of a cultural appropriation rather than an intercultural history. Many of the paintings which inspired the book are in national art galleries and can be visited but their true place is on the skin of those taking place in ceremonies. The painting on the cover of the book is by Mrs Burrarwanga and is a yirritja design, the painting on the back of the book is by her husband and is a dhuwa galpu design that seals it. The book, as a written text, cannot readily be something that accounts to Aboriginal Australians for the great evils and invasion of their land, but I hoped it could begin a new level of discussion. I was surprised to find that my great, great, great, great grandmother Honor Hughes a refugee of the Irish genocide, lived on Bruny Island with Truganini, a refugee from the Tasmanian genocide. What could they have said to each other? Probably nothing could be said. Yet being totally historicised fiction I could imagine the beginning of a discussion that would also lead me to Batumbil and Ms.Gurruwiwi. ✿ How did you learn the traditional Aboriginal stories that are included in the book? From a very small child, I grew up with Aboriginal stories. My father was an English teacher who wrote his Masters thesis on Vance Palmer and I remember reading many stories of the bush. There was a basic and crude understanding of Aboriginal oral history in the texts of those days. From the age of 10, I lived in Papua New Guinea and I remember reading the essays of the first generation of Papua and New Guinea university students about their creation stories of their homes from New Ireland to the Sepik River to Goroka. Then I did my last year of high school in Upstate New York and naturally enough my major HSC writing was on the five nations of the Iroquois around where I was living. After that, there was a long lacunae where I worked alternately at manual jobs and then for the Australian Labor Movement running think tanks and public policy projects. In 1991 I along with several national Aboriginal leaders created the Indigenous Stock Exchange with the idea that we would create investments in Aboriginal businesses and social and cultural organisations. The thought was that we would create alternative investment streams than just the money coming from the State capitals and Canberra. That has been a long and interesting ride with all sorts of lessons. However from that time I have become very close with many Aboriginal elders and leaders. Our principal was always that any project supported by the ISX had to come directly from the community. It was a good principle but it has also meant that things have had to develop over time. 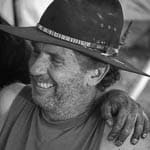 To do anything meaningful in any part of Aboriginal Australia means learning directly from Aboriginal people themselves. You can read a lot from the academics who were paid to transcribe and record Aboriginal stories. But no matter how well that is done, you have to be sitting down on Country with elders hearing directly from them. The ISX gave me that opportunity on the South Coast of NSW, in the Goulburn Valley, in my own childhood places around Frankston and Seaford, across Cape York Peninsula, across the Pilbara and in Broome, the Dampier Peninsula and the Kimberley and in the place where I have done my deepest level of work and thinking across the Miwatj lands of North East Arnhem Land. I was adopted into the Galpu plan and take my family responsibilities in Arnhem land seriously. 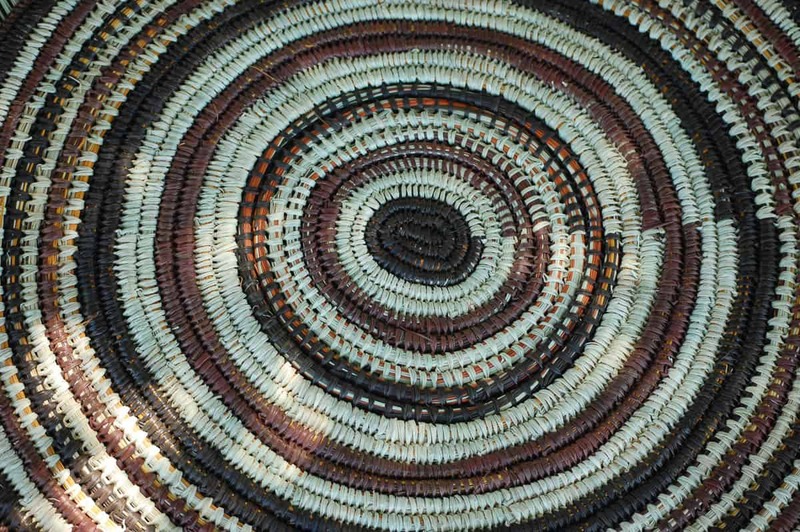 My main mentors about Yolŋu stories were Ms Gurruwiwi and Mrs Burarrwanga and Djalu Gurruwiwi. 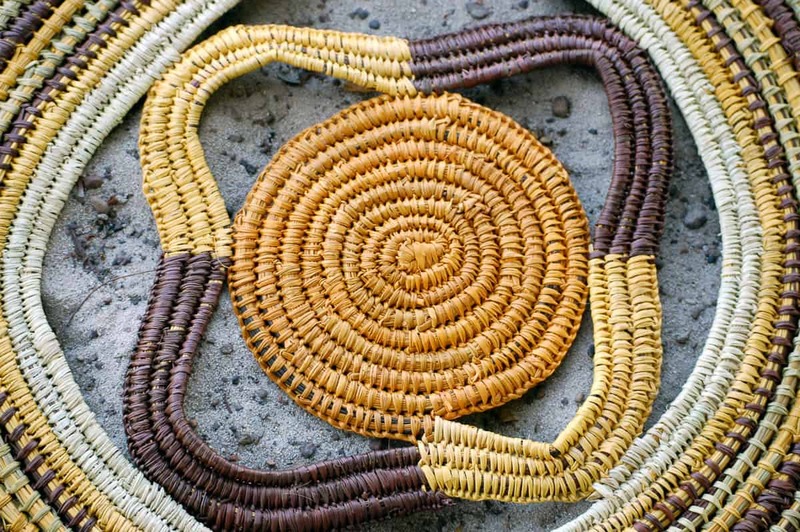 ✿ What do you hope to contribute to Aboriginal communities? 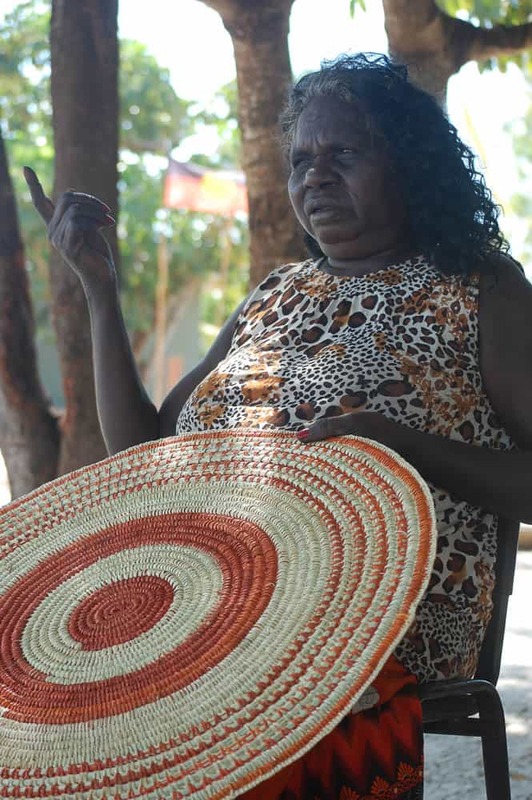 The work I have been doing in Arnhem land for 10 years now has been about supporting an independent homeland movement and individual Aboriginal elders to support their families. I have personally raised about $300,000 to support Arnhem land communities notably Mata Mata and Gikal and the Galpu clan over the past decade at an average of about $30k a year. This is a drop in the ocean compared to what is needed. However, I and the ISX ensure that funds go directly into the hands of Aboriginal elders with no middlemen and no administrative or management fees or any bypassing of funds to non-Aboriginal experts. The problem with both government and private corporate royalty payments is that very little goes directly to the people and it invariably does not address the most pressing needs of the community. I could write several books on the problems of the so-called Aboriginal funding dollar. Over recent years we have tried very hard to build a fleet of reliable cars for Mata Mata and Gikal so that scarce dollars can be used for purchasing goods that will benefit the community and not just the local plane and charter services. Without a car, the cost of a fortnightly grocery visit is $800 for a small plane before any groceries are purchased. A car reduces this to about $100 taking into account wear and tear on vehicles. But every solution creates new demands and pressures. The next phase of the work will be to create something like a homeland cooperative or mutual with transparent accounts and with a traditional decision-making body. One of the longed-for dreams is to revive the homelands school abandoned after the missionaries left Arnhem land. Again that is a whole story in itself. We have a situation where one of the few Yolŋu trained teachers is living on the homeland with a very good school building at her disposal and where people can live sustainably but the government prefers to fund a mainstream school system in which Aboriginal people must live artificially and without employment and alongside clan groups that have traditionally been separated from each other. It is a disaster and it is no wonder that school attendance is something like 50 percent if that. 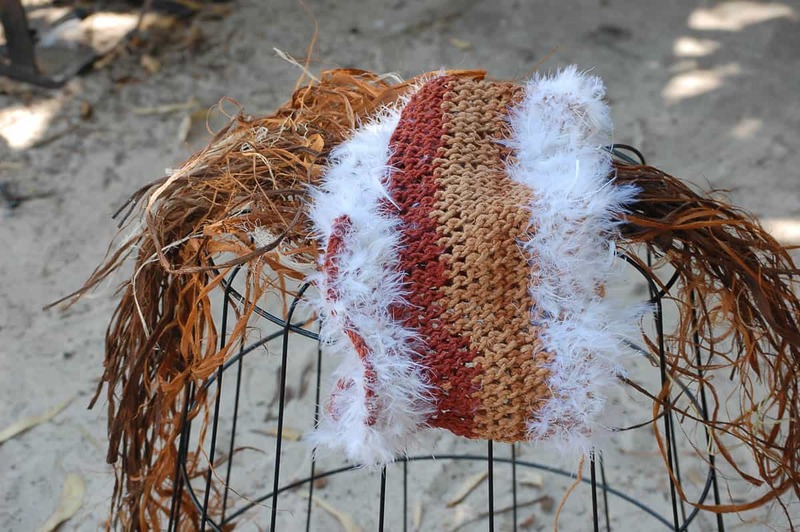 ✿ What is the main thing that non-Indigenous Balanda can learn from Aboriginal cultures? I think the speech I gave at the launch of Wakuwal probably answers this question. You can find the transcription at this link. The bottom line is that non-Aboriginal people have much more to learn from Aboriginal people than the other way around. There can be no authentic Australian nation until Aboriginal cultures are recognised as the foundation of our nation and the guiding wisdom through which our land, sea and sky talks to us and expresses itself. Peter Botsman is a writer that lives on his farm at Kangaroo Valley, an oasis between the Southern Highlands and the South Coast of NSW. He is passionately involved in supporting Australia’s Aboriginal Renaissance. His ongoing work can be found at www.isx.org.au and www.workingpapers.com.au Wakuwal can be purchased through Valentine Press at this link.